The first person to step onto the runway of Sealaska Heritage Institute’s inaugural Native Fashion show Friday night wasn’t a model or a designer, but a dancer, Kindeshaun Austin of Juneau. To the beat of a drum played by Zak Wass in the cedar clan house of the Walter Soboleff Building, Austin began to dance in traditional Tlingit style, crouching and bending his knees deeply, and holding his arms at right angles in front of his body. Slowly, as Maka Jinaatlaa Monture sang in the background, the style of his dancing began to change, transitioning into the fluid movements of modern dance and hip hop. Though it had nothing to do with fashion, Austin’s brief performance was closely tied to one of show’s major themes: the idea that traditional and contemporary Native art are part of the same continuum, one that has always been in motion, adapting and evolving over time. That dynamic — expressed in very different ways by 18 designers — fueled the high-energy, sold-out fashion show, hosted by the institute as part of its four-day dance-and-culture festival, Celebration. Some designers used traditional materials such as seal skin and cedar to create modern silhouettes; others referenced traditional artforms, such as beadwork and weaving, in unexpected ways; and others translated traditional Northwest Coast designs into original, contemporary patterns. Collectively, the pieces reflected the artists’ pride in their indigenous cultural heritage and an optimism about the future possibilities of contemporary Native fashion. In introductory remarks, designer Jackie Pata Johnson, one of the show’s organizers, said the designers’ works are strong expressions of cultural identity, like traditional regalia, but in a more practical, everyday form. “We’re really excited to be able to embrace this thought and this feeling that not only is our culture special to us when we come to Celebration or when we put on our regalia during ceremonies, but that we are Tlingit, Haida and Tsimshian every day, and that those representations of our traditional regalia can be with us in expressing who we are,” she said. The show featured established designers from out of town as well as local artists experimenting with contemporary fashion for the first time. 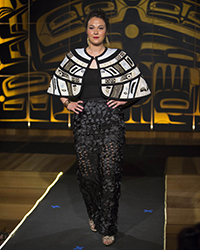 In the first category was internationally known Haida designer Dorothy Grant, voted one of the 100 Most Influential Women in British Columbia by the Vancouver Sun, who showed several full length white gowns featuring contemporary patterns based on traditional Northwest Coast formline design, as well as the Eagle/Raven tuxedo she created for “The Revenant” actor Duane E. Howard to wear on the red carpet at the Oscars. In introducing her work, fashion show MC X’unei Lance Twitchell said Grant’s pieces embody the Haida idea of yaangudang or self-respect. “The driving force behind her clothing designs is empowerment, pride and feeling good about oneself,” he said. Design team Lily Hope and her aunt Deanna Lampe grounded their work in their Tlingit culture by creating dresses and skirts adorned with traditionally inspired embellishments: shell buttons placed to reflect traditional basketry patterns, and wool and cedar fringe adorned with more than 700 silver noisemakers, as well as a dramatic obi-style cedar belt, cedar earrings and cuffs. Hope, a weaver who lives in Juneau, and Lampe, a beadworker, said they believe indigenous-designed fashion can help raise cultural awareness and foster cross-cultural respect. Other pieces in the show also included a seal skin corset backed with gold lambskin, created by Inupiaq designer Bobby Itta of Barrow and Anchorage; sea otter outerwear by Tlingit artist Louise Kadinger; traditional Ravenstail robes created by Shgen Doo Tan George; beaded black hats by Metlakata artist Kandi McGilton; Shyla Germain’s black-and-red, high-collared tunic, inspired by the shape of Tlingit armor; and Maria Shaa Tlaa Williams’ purple separates, inspired by the story of when Raven first saw lilacs. The full list of designers who participated in the show is: Shgen Doo Tan George, Dorothy Grant, Janice Jackson, Pam Baker, Jackie Pata Johnson, Rico Worl, Maria Shaa Tlaa Williams, Rosita Worl, Heather Dickson, Amy Mitchell, Shyla Germain, Lily Hope and Deanna Lampe, Kandi McGilton, Marcus Gho, Bobby Itta, Louise Kadinger and Crystal Worl. Artist Alison Bremner, one of the models in the show, composed the song sung at the beginning of the event. Due to the success of the inaugural fashion show—which was sold out weeks in advance—SHI is considering making it a permanent part of Celebration festivities.